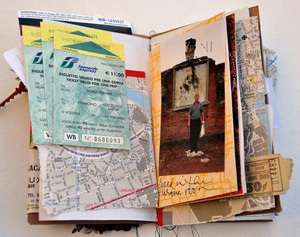 If you are one of the many travelers who loves to keep notes of your adventures and everyday travel, then do not carry a travel journal with you to the next destination. They are heavy, they have no connection with the place you are travelling, and they are often hard to start writing in due to a fear of messing up that first page and spoiling what is to follow! Purchase a small thin notebook, say size A6, made in the area you are travelling, if not the country you are in. You will also have a story to write on the purchase from a local newsstand owner, stationery vendor or artisan at a market. Its cover and paper will also ooze with the local culture, language, design and unique feel. Instead of writing too much blah in that story, this will quickly fill, and it will be ready for popping in an envelope with a beautiful local stamp (or two), and posting home to yourself. Postmarked envelopes are like passport stamps in that they mark where you were and when. When you finally return home, each envelope will reveal a neatly parcelled chapter of your journey. And don’t throw away those receipts or tickets – they are an integral part to the journey, that can provide your best recall associations and be your most treasured mementos. Save those headed paperwork, ticket stubs, local food wrappings and coasters and keep in a Ziploc bag to be posted home every week or so, just as when your small notebook journal is filled. Something a blog, in its virtual reality, can never do!